Ohaguro (which may be translated as ‘blackened teeth’) is a practice in which people (usually women) dye their teeth black. Whilst this custom is known to be practiced in different parts of the world, including Southeast Asia, the Pacific Islands, and even South America, it is most commonly associated with Japan. 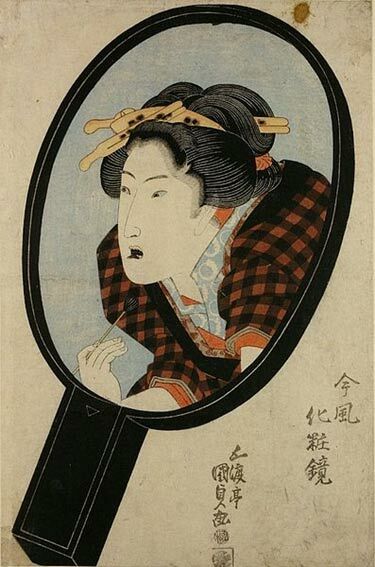 It is undeniable that traits deemed attractive and beautiful are often dictated by a society, and black teeth, until the end of the 19th century, was regarded as a sign of beauty in Japan. 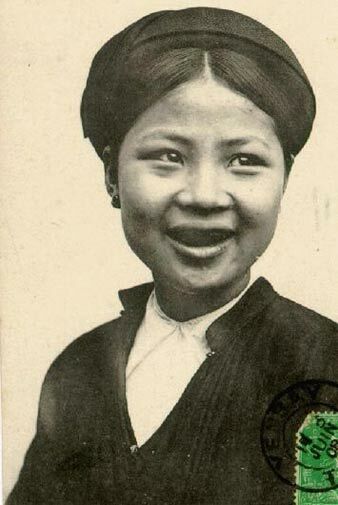 Nevertheless, blackened teeth were more than just a mark of beauty in Japanese society, and served other purposes as well. The traditional method for obtaining black teeth through the practice of Ohaguro involves the ingestion of a dye. First, iron fillings are soaked in tea or sake. When the iron oxidizes, the liquid would turn black. The taste of the dye is said to be harsh, hence spices such as cinnamon, cloves and anise, would be added to it. This dye would be drunk, causing the drinker’s teeth to turn black. In order to keep the teeth black, the process be repeated once a day or once every few days. The results seem to have been permanent, as there are skeletons from the Edo period whose teeth are still black due to the practice of Ohaguro. 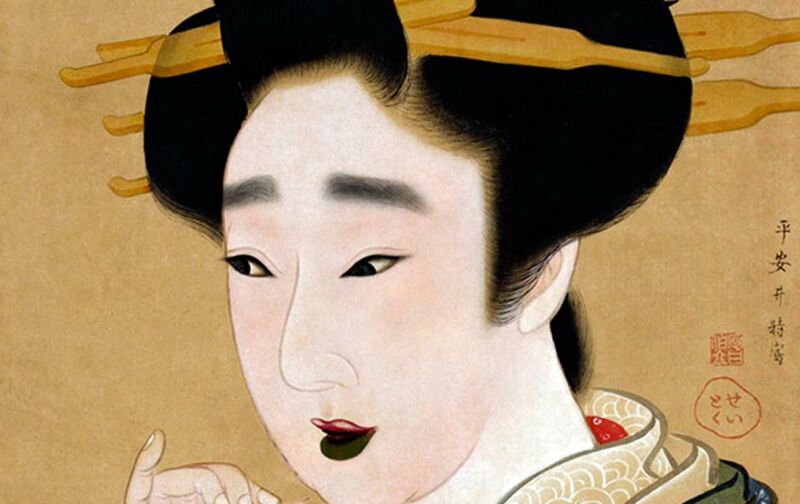 Apart from black teeth, white faces were another desirable trait during the Heian period. Unfortunately, the white makeup, which was made of rice powder, could potentially cause a person’s teeth to look yellower than they actually were. In order to overcome this problem, women painted their teeth black. When a person’s teeth are shown, an illusion is created in which a wide smile is presented without showing one’s teeth. Apart from being a statement of beauty, the practice of Ohaguro is said to have strengthened the teeth and protected a person from dental problems such as cavities. Furthermore, the samurai practiced Ohaguro, so as to demonstrate their loyalty towards their masters. 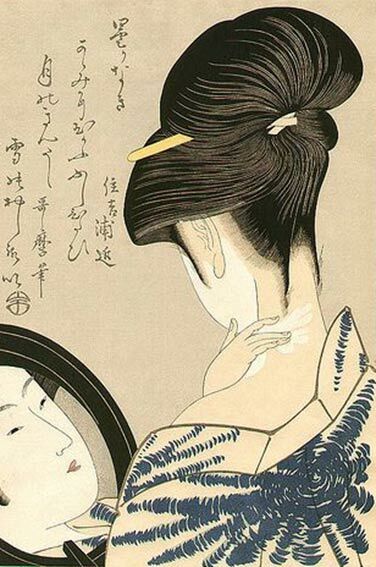 Ohaguro continued to be practiced during subsequent periods of Japanese history. By the time of the Edo period (17th – 19th centuries AD), this practice had spread from the aristocratic class to other social classes as well. During this period, Ohaguro was commonly practiced amongst married women, unmarried women over 18 years old, prostitutes, and geishas. Thus, black teeth signified a woman’s sexual maturity. 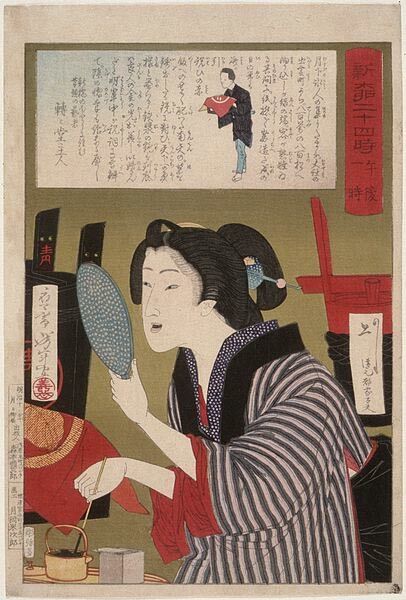 During the Meiji period which succeeded the Edo period, the practice of Ohaguro fell out of fashion. As part of the new Japanese government’s attempts to modernize the country, Ohaguro was banned in 1870. The new trend in Japan, with regards to teeth, was to keep them white. This new fashion was ‘endorsed’ in 1873 when the Empress of Japan herself appeared in public with a set of white teeth. Soon, white teeth were regarded as a mark of beauty, and Ohaguro slowly lost its appeal amongst the Japanese. Although Ohaguro died out eventually amongst the general public in Japan, it can still be seen in the Geisha quarters in Kyoto. 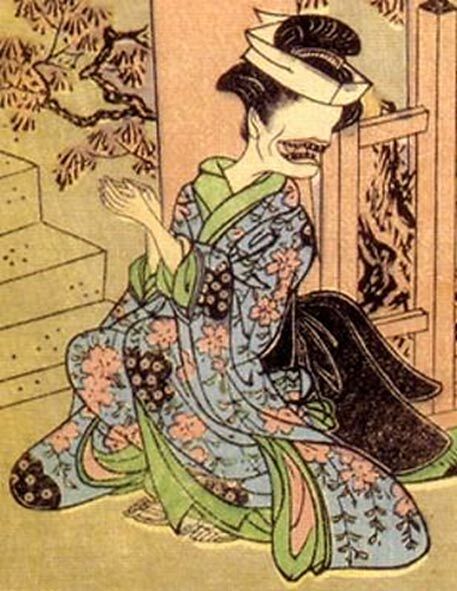 Interestingly, there is a yokai (a supernatural spirit / monster in Japanese folklore) called the Ohaguro Bettari (translated as ‘nothing but blackened teeth’). This yokai is believed to look like a beautiful woman (from the back at least) dressed in wedding clothes. She is said to enjoy calling single young men over to her. Whilst they come towards her, she keeps her face hidden from their view. When the men come close enough, she reveals a white face that is featureless, except for a huge mouth with a set of black teeth. Apart from scaring the men out of their wits, this yokai seems to be pretty harmless, as no deaths or injuries have been attributed to her. well its a step up from foot binding at least. So very interesting! The articles mentioned other countries where black teeth was the fashion – what are these countries? or all of them are at some point in time. just look at our current tattoo craze. Totally freaking nutz and the sooner this fad dies the better people look freaking ridiculous. Mercury treatments for Syphilis would turn the teeth black. Why not make it a fashion? In Europe women filed down the black until their teeth were gone.